← A Roof That Lasts A Lifetime? It’s Possible With The Right Materials! 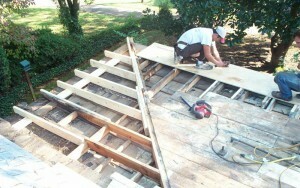 “You get what you pay for!” Sure, it’s a cliche, but in the roofing business, it’s true! Most homeowners will obtain quotes from several roofing contractors before hiring them and in many cases, these quotes can vary, sometimes by hundreds or even thousands of dollars! It can be tempting to go with the cheapest option, but do you really want the cheapest roof to protect your home and everything in it? The roofing business in Metro Atlanta is extremely competitive, with small and large organizations everywhere, roofers are vying for your business and sometimes some will undercut others by hundreds even thousands of dollars. How do they do it? Most costs across the industry are similar, especially in terms of materials, there are only so many ways a company can undercut another, sometimes to the detriment of the company in the form of lost profits but more often, to the detriment of the homeowner in the form of cost-cutting measures to maximize profit from a cheaper-than-most quote. So, what are the dangers of going with the cheapest quote? One of the most common methods of undercutting the competition without it being obvious is to use the cheapest materials you can find. This has the benefit of making the job look nice (to the untrained eye) immediately after it is completed and give the illusion that the homeowner got a great deal. The problem with this is that sub-standard materials don’t last very long and usually begins to fall apart in even relatively small storms, if the original contractor isn’t around to repair these problems as they come under warranty (and more often than not they aren’t), the homeowner will be stuck with the costs to repair and potentially redo the entire roof all over again. Another way to cut costs to balance a cheap quote is to take shortcuts during the install, reducing the total labor costs to eke out a profit to the detriment of the homeowner. While this takes care of any concerns about cheap materials (especially in cases where the customer wants specific materials), most homeowners don’t understand the installation process and as long as it looks good, don’t put up any arguments or ask questions. The biggest problem with this is that manufacturers have very specific installation instructions and if these are not met can and often do void the warranty, even insurance! These are not in place just to protect the manufacturer but also to ensure their product performs optimally. By taking shortcuts these materials often fail and if the contractor is no longer in business, the homeowner is left with the full costs to repair and/or replace the entire thing. Even if you get the one man band that not only is good at his work, he provides the materials as promised, but he still needs to make up for having the cheapest quote as even the best roofers need help with installation of a new roof and costs can skyrocket. In many cases, these small operations may cut costs by failing to obtain proper insurance, permits, and other things that hurt the bottom line if they can’t cut anywhere else. If they don’t they won’t be in business too long as working at cost or at a loss isn’t good business. Be sure the contractor your hire is not only properly permit-ed but also has the proper insurance to cover things like accidents and damage to your property, otherwise you may be looking at much more than a roof bill but medical and other bills. Not every solo or small operation is a scam and in some cases, these guys can do great work with great materials while being fully insured and still offer the lowest price. How do they do this? Simple, they don’t have the overhead that others have. Things like, a dedicated office-based support staff, multiple crews, and 24/7 service. These things cost money and without them you can undercut many companies while providing a good initial experience, beyond that is when the problems occur. Companies that don’t invest in support infrastructure don’t last very long and if they do, you may find getting hold of them may be next to impossible or they can’t honor their warranties for weeks or even months. Many roofing scams are the simplest, they dress up like roofers, they even make their truck look official with logos and ladders. They present very authentic looking paperwork that shows them to be on the up and up, some of them even have websites! They may even get up on the roof to make it look like they are doing an inspection. But at the end of it all, they simply do nothing. They explain they need money up front for this, or money up front for that. They may even begin the work (or look like it by tearing your roof apart) and stop, saying they need more money or they can’t continue. Once they have all the feel they can get, they simply leave. No further communication or work, they just take the money and run. Of course, this isn’t to say that the lowest quote will always be a scam or bad deal, especially if you’ve done your homework and are dealing with true professionals, but if a quote comes in that is too good to be true or undercuts the others by a wide margin, be wary and do your homework, while we all want to get the best price for the things we need, cheaper, especially in roofing, is almost always never better. Get the job done right the first time! Call Atlanta Roofing Specialists at 770-419-2222 for your FREE quote today! We may not be the cheapest, but with one of the highest customer satisfaction ratings in the business and decades of proven success we are one of the best! This entry was posted in Consumer Advice, FAQ, Roof Education, Roofing Advice, Saving Money, Tips and tagged cheap roofing, Finding a roof contractor, Roof Advice, roofing scams. Bookmark the permalink.